The Parening Kneeling Mat helps to prevent discomfort when sat beside the bath tub while playing with and washing your child each day. We all know that hard surfaces can be cold and painful to rest on but this well padded, non slip and mildew resistant mat makes bath time enjoyable - even if you get wet from your little one splashing about! It features a hanging loop for storage and ease of drying and as I already use suction hooks for our wash mitts and scrunchies I hang the mat on one too. Simple. It's lightweight and I really like the bright spotty design to bring some colour into our bathroom. I've also found this really useful while washing my own hair knelt beside the bath from time to time, it's a rather versatile product. With two little ones sometimes sharing a bath there isn't much room for swooshing about, although they try, so keeping hot taps covered helps to ensure the Mini Mes don't get a bump or burnt in the process. The Bath Tap Protector is an essential and great value item at only £9.99 and it's easy to install over single or mixer taps. It cleverly changes colour as heated water runs through it into the bath and the word 'hot' appears so you can safely tell if it's warm without touching. It's soft yet durable and it has already saved my toes on numerous occasions from touching the tap while relaxing! I really wish I had got one sooner - it's very helpful. Koo-di's Fluffy Baby Blanket is ideal for keeping your child snug once in their pj's and preparing for bed. It's trimmed with the polka dot print as featured on other products from the range and is made from soft polyester which is gentle against delicate skin. The blanket can also be laid on the floor as a play mat and it's ideal to take while travelling for in the car or pram. It's quite large in size so will last for may years as your little one grows. 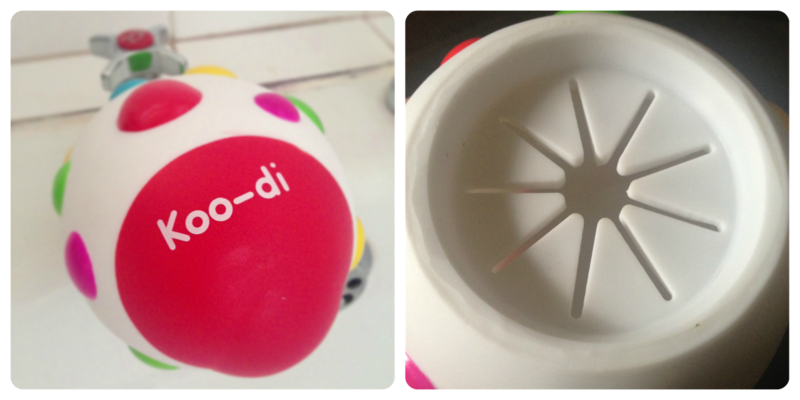 What is your favourite Koo-di product? The kneeling mat is my favourite - what a great idea. I only wish I'd thought about it when my kids were small. OMG That Kneel pad is a great idea - though it still won't help me get up from my knees without oohing and ahhhing! Age is slowly turning against me eek! I bought the book yesterday!